Boulder beats all — at least when it comes to economic growth. Newly released data from the U.S. Census Bureau shows continuing signs of growth across the nation. NerdWallet dived further into population, employment and income statistics to find the parts of the country that seem to be rising the fastest. Boulder is rising — and rising fast. Driven largely by its burgeoning tech scene, a substantial leap in wages propelled Boulder to the top of our rankings. California and Texas are home to many of the fastest growing cities in the country — each state has four cities appearing in the top 20. California also has several cities placing at the opposite end of the ranking, with six cities in the bottom 20. Florida is home to four of the bottom 20, with Fort Myers coming in last of all 506 cities. Lehigh Acres, Florida, has experienced the highest growth in population since 2009 — its working-age population increased 59% in just half a decade. Boulder has experienced strong growth in recent years and it doesn’t appear to be slowing down anytime soon. The average earnings for workers in Boulder increased more than anywhere else in the nation from 2009 to 2013 — a nearly a 50% income growth rate. A growing number of businesses, especially in the tech sector, have propelled the city’s rise. Last year, a technology policy coalition named Boulder No.1 in the nation in technology startup density. The hometown of Texas A&M University has seen rapid growth in its population since 2009. While College Station’s population grew at a rate of almost 18%, the average income also saw a substantial increase, rising by more than 25%. The Research Valley Partnership, a program affiliated with Texas A&M, helps businesses expand and also attracts new companies to the College Station area. The city of Lawrence has had its share of challenges, especially when it comes to its economy and crime, but some positive trends point to improvement. Although average earnings in Lawrence actually fell from 2009-2013, employment increased substantially. In fact, the city’s 24% growth in the percent of residents in the workforce is the highest of any city in the country. Located in the Rust Belt, Muncie’s economy has evolved in recent years to one with opportunities in health care, education and retail. Muncie has seen strong growth in population, employment and especially income, where median earnings have grown nearly 25% since 2009. The city’s top employer, Ball State University, is also its largest college. As home to the largest university campus in the state, Indiana University Bloomington, this city has seen continuing growth in population and average earnings. But all of that growth isn’t making workers more stressed: Bloomington recently came in at the top spot in our study on the best cities for work-life balance. The outlook seems strong for this Douglas County seat. It posted strong growth in wages — a nearly 38% jump in average earnings from 2009 to 2013, according to the new census data. Also positive was the 3.42% increase in employment during the same time period. This area saw a slight tick downward in its working-age population growth with the new census numbers, but that was offset by strong growth in employment and earnings. More good news for residents: craft beer. The city recently celebrated the news that a standalone brewery, Beaver Island Brewing Co., is coming to town. This small city in the San Jacinto Valley — home to about 80,000 residents — earned a spot on our rankings for its strong performance on all three factors we analyzed: growth in working-age population, employment rate and average earnings. New residents are often lured by Hemet’s affordability after they are priced out of many other Southern California communities. The average home price in Hemet is $173,242, according to Realtor.com, which compares with the average of $341,894 statewide. What stood out in the data for Ann Arbor was its exceptionally strong growth in inflation-adjusted earnings from 2009-2013. There, workers enjoyed a 31% increase in average earnings. According to city projections, the strong wage trend should continue, and by 2015, more than 3 in 10 households in the region are projected to earn over $100,000. Another iconic university town, Gainesville is no stranger to the yearly influx of young people. But in 2009-2013, this home turf of the University of Florida saw a nearly 11% jump in its working-age population. That strong economic indicator was further bolstered by a 20% increase in average earnings during the same period. 1. 2009-2013 growth in the working-age population (16 and older) from the U.S. Census Bureau American Community Survey. 2. 2009-2013 growth in the percentage of the working-age population in the labor force from the U.S. Census Bureau American Community Survey. 3. 2009-2013 growth in median earnings for workers from the U.S. Census Bureau American Community Survey. All three factors were weighted equally. The study analyzed 506 of the largest U.S. cities. 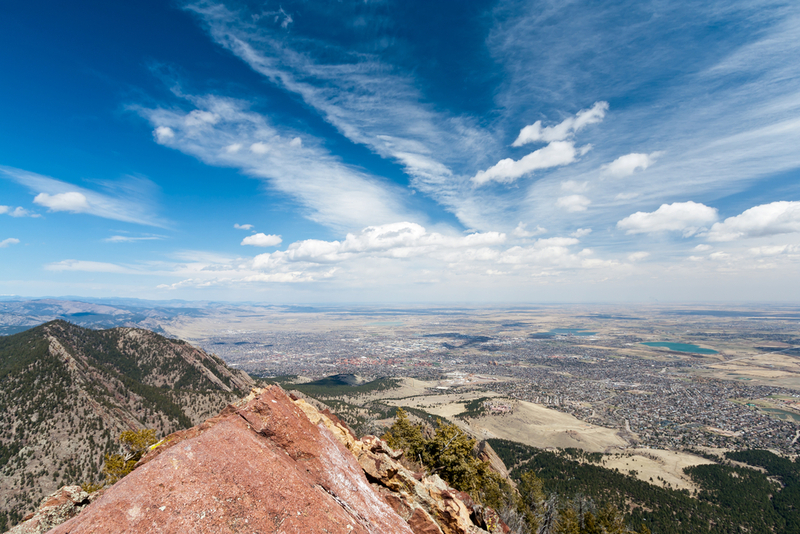 Boulder, Colorado, image via Shutterstock.